So, as mentioned on my previous post, Bebe and I promised ourselves that we would stay up really late just to watch the Super Bowl live. We did. Because of the seven-hour time difference, Super Bowl was at around 12.30AM [February 7] here in Sweden. Bebe took a nap at 10PM. I woke him up just minutes before the game started. We were really pumped up. Just like all the Steelers fan out there, we were very much hoping for the Steelers' 7th Super Bowl. Unfortunately, it did not happen. The Day After: Although life goes on, the day after hasn't been so much fun. Bebe and I still have deep sighs. Regrets? None. Just hoping that the result is the other way around. Well... for all the Steelers fans, let's just hope that our dear NFL team makes it to the Super Bowl again on the next season and hopefully, win it! :* so cute! the two of you wearing #43..yay! Thank you so much GG! d kau mo halata na fans hehe..cute au mo na couple tan awon...anyway pildi man mo noh hehe ok ra na next season basin diay mudaug inyo team..
Oo nga. Hopefully, next season, makadaog... Wish wish wish. Hala uy! Naka- uniform. That's so cool, Pretty Maxi. I love looking at your beautiful, deep dimples, hehe! 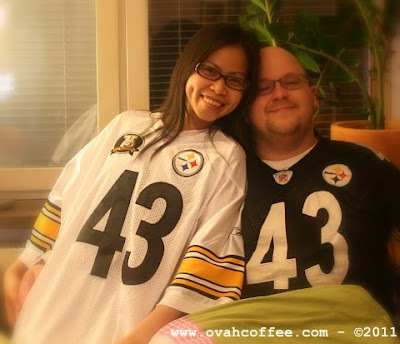 huhuhu steelers lost but you do look great with your jerseys! So sad... Steelers did not win!